Next came a spin on fish and grits. Instead of plain cheese grits, Gomez chose to make grits with kichidi, a rice and lentil dish. The texture was rich and creamy and it gave the dish a little kick from ginger. The fish was tender, and the rub on it had enough spice to balance the creamy grits. 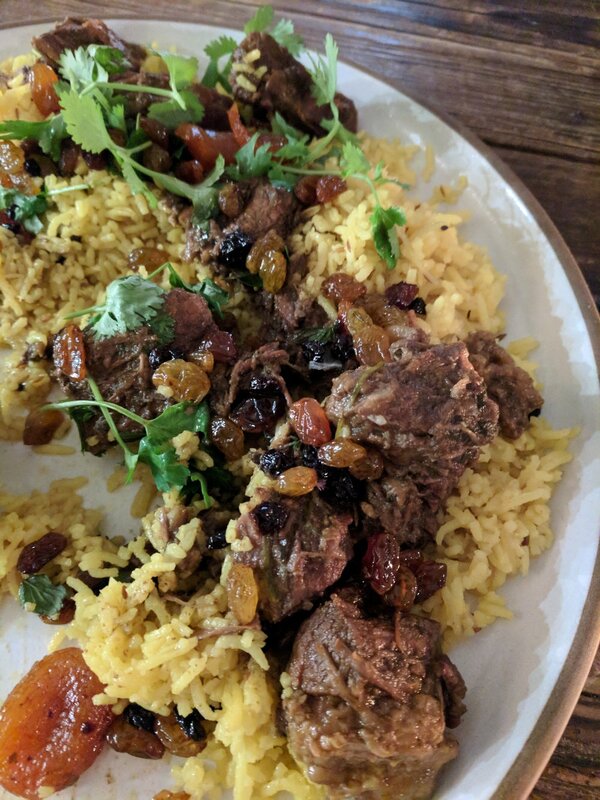 The family-style beef biryani was probably my favorite course of the meal. The beef was tender, and the curry was creamy and subtle. The salt of the rice complemented the sweetness of the dried fruit. If this had been the first course, I might have cleared the communal plate. Truly enjoying carrot cake is a new experience for me. With that said, Gomez's recipe is now my gold standard. The frosting was creamy and slightly peppery, while the cake itself was mildly sweet with texture added by the bits of carrot. How has it been six months since the last post? I have a lot of excuses, but the short version is that a lot has happened, and I've been traveling for most of the summer. A few things happening currently: I'm now the cocktail columnist for The Bitter Southerner, I bartend most Wednesdays at The Marble Ring, and I'm working on launching a video class series and pitching a second book. I'll tell you more as I can. I came back to the blog to write about my recent trip up to the Billy Reid Shindig in Florence, AL. A few things to start: I'm not a fashionista, obviously, but Shindig is a celebration of more than fashion: it also highlights music, food, and culture. To check it out from the industry side of things, Adam and I headed up to Florence for a couple days. That Thursday, we headed up a day early to catch the Asha Gomez opening dinner at The Factory, the café at Alabama Chanin. In addition to being the opening dinner for The Shindig, it was also the final 2017 Friends of the Café dinner. This series was started a partnership with Southern Foodways Alliance (SFA), and has raised funds for SFA for the past three years. The partnership arose very organically. Natalie Chanin, the designer behind Alabama Chanin, is a long-time supporter of the SFA. Part of their mission statement, in fact, reads "At Alabama Chanin, we preserve traditions of community, design, producing, and living arty by examining work and life through the acts of storytelling, photography education, and making." As the SFA is dedicated to telling stories about the South and Southern food, the two are well-matched. This dinner featured the food of Asha Gomez, a native of Kerala, India who now lives and cooks in Atlanta, GA. Her food takes cues from the "sum total of [her] life experience." But don't call it fusion--she "despise[s] the word 'fusion.' It's the other F-word to [her]." In Atlanta, she is chef of , and her food there and at popups like this one integrates Southern Indian flavors with much of the simplicity of Southern cooking. It also featured wine selections that were perfectly pitched to bring out new flavors in both the wine and the food. Dinner itself opened with a cocktail hour featuring Blackberry Farm Brewery’s beers and the Muscadine Vine, a prosecco and muscadine cocktail that was bubbly and refreshing without being overly citrusy or sweet. During this time, I got the chance to peruse Chef Asha Gomez’s cookbook and learn a bit more about her cooking style. Cocktail hour also yielded up some delicious hor d’oeuvres: savory curry chicken samosa pockets and crunchy fry bread with zest mint chutney and pickled carrots. We each had seconds of both. When paired with these small bites, the Muscadine Vine was a subtle, delicious accompaniment. The citrus cut the fat of the fry bread and richness of the samosas' bread. Luckily for us, the best was yet to come. Before we sat down for dinner, we reconnected with some locals who we'd met the last time we were up in Florence, and met some more of their friends who were at the event. After we were seated, Natalie Chanin welcomed all the dinner-goers to the event and introduced John T. Edge, director of Southern Foodways Alliance. He spoke to the importance of meals like this, both in funding SFA and in bringing people from all sorts of backgrounds together at a common table. He also introduced Gomez as a human and chef who "believes in and claims an American South with beauty...persistence, and great food," and the dinner as an enabling force for backing "stories that sketch a new horizon for the South." Gomez came next to talk about the food we were about to eat. For her, the food is a way to bring together and celebrate her experiences and life both in Kerala, India, and Atlanta, GA. Then came the food [see gallery]. From there, we headed over to Odette to hang out with Brian Lovejoy, our friend and host for the weekend. We left there around 11:30, and were back on Friday around 2 to stake out some bar seats. During the course of the night, I met one of the guys from Muscle Shoals Sound, made friends with several others who came through, and ate some delicious steak. And pork skins. And fried okra. And rosé. Unfortunately, I wasn't feeling well after Friday night, so we headed back after brunch at The Factory on Saturday. Full disclosure: I was invited to this dinner as press.